I had been watching one of the Great Blue Herons at our local wetland preserves a few weeks ago; she only had one baby, which is a bit unusual for the species. 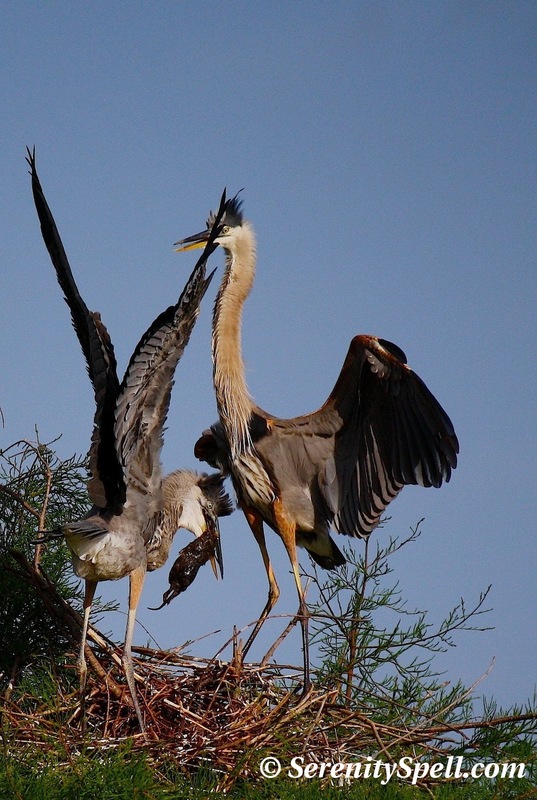 I watched as she built her nest high in the cypress trees, then dutifully guarded it, alone…. There was no male in sight, which is likewise unusual. Usually both the male and female remain at the nest, and hunt for the young. There aren’t as many human visitors at these particular wetlands, due to the lack of active rookeries — which suits me just fine; the baby alligators, birds, butterflies, marsh rabbits (or swamp bunnies as I’m fond to call them), and if I’m lucky, bobcats, keep me company. I always spied this Great Blue hunting in the same area — a swath of dry land near a small swamp frequented by the bobcats. Visitors would stroll right by her, she blended so perfectly with the landscape. This choice of hunting grounds would explain her meal below — Yummers! It’s no surprise that these birds have been known to choke to death while trying to swallow meals that are too large for them. What has she been trying to regurgitate…? I guess mama had a reason to tell us, when we were younger, not to put to gobble our food and fill our mouths so full after all!! A lesson for us all!! Thank for the great pictures – of such great quality as usual!!!!!!!!!!!!! Heh — So true! It’s no wonder it takes poor momma so long to regurgitate these meals, when they’re this LARGE! Ouuu ick!! I think I like seeing chewed up fish a bit better than the rodent!! You can see the feet and tail and everything!! Very nice record of the meal..definitely their diet is not limited to fish. The Great Herons are so beautiful and elegant but the feeding time for growing young is certainly a stage with a certain ick factor. But, I like that it keeps us grounded in the awareness that its life with all its soaring beauty and gooey necessities. Exactly! One of my favorite reasons for escaping to nature is for grounding… And this is a great example of following that practice, for sure! I was just stunned at the rat’s sheer size. Wow. Bean’s Pat: Serenity Spell http://tinyurl.com/87qcugr A young great blue heron’s meal. Great photos. Blog pick of the day by this wondering wanderer. 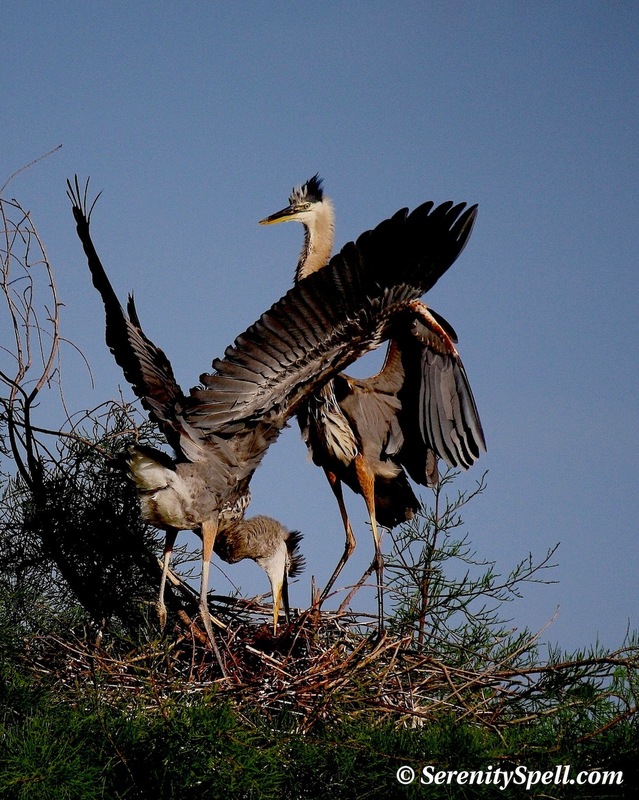 Stunning Photos of these juvenile blue herons!